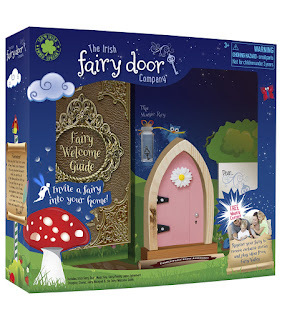 Last Christmas, I stumbled across a Fairy Door from the Irish Fairy Door Company. On a whim I added it to my cart and purchased it for my daughter who was 6 years old at the time. The doors come in different colors and styles and it comes with a magic key (cool, right?) Your child can name their fairy and can register his or her fairy on the Fairy website (https://us.theirishfairydoorcompany.com/collections). When your chosen box arrives you mount the door somewhere in your home or outside. We chose a shelf in my daughter’s closet for the door to be mounted. I mounted it with Velcro Command Picture Strips. Once your door is mounted the perfect fairy for your child moves into it’s fairy home, signs the lease agreement and takes the key. What do they write about? D tells her fairy the special things that happen in her life, and any troubles that she is going through, and Tulip gives her advice. I give her advice too, but somehow she thinks Tulip is wiser 😉 . Like the time D fell off her horse during her riding lesson and was afraid to go back and try again. Tulip shared with her the time she fell off her dragonfly during her flying lessons and what helped her (D got back on the horse to make Tulip proud, and she is still taking lessons.) D’s friends have left notes to Tulip when they are over here for a playdate, and keep this between us, but the older bro has even written to Tulip too. Of course, he asked for money for something I had no idea he wanted (so I knew what to add to his Christmas list). Tulip wrote him a nice note back, but informed him that fairies were generally broke (except for the tooth fairy. That fairy is loaded.) D asks questions about fairy life, and Tulip shares some of her adventures. Sometimes they just leave pictures. D might surprise Tulip with a new small animal for her yard. Tulip sometimes leaves tiny notes in drawers for D to find. D tells me such detailed and imaginative stories about Fairy Land. 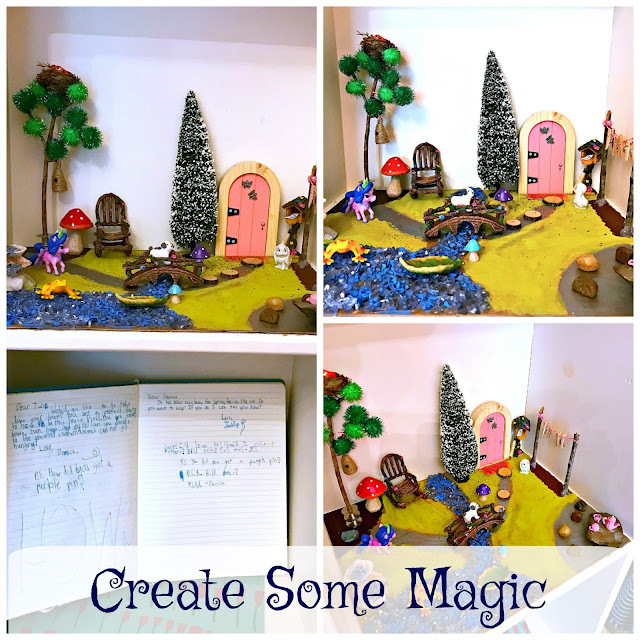 She has created a whole world in her imagination around Tulip and her fairy friends (maybe this is how J.K. Rowling started?) She also takes these stories to school with her and she and her friends have amazing recess adventures inspired by Fairy Land. This year D wanted to surprise Tulip with a new front yard for Christmas. I told her she would have to find most of the materials around the house or outside. D came up with a rough design and plan for her yard, and went to work finding things to make it happen. D found some cardboard, and some rocks for a table and some sticks. I gave her a $5 budget (little budget planning lesson) to use at the craft store to buy some other things for Tulips yard, and she used that to purchase some green pompoms for the tree, a birds nest, and a miniature broom because it is super important to keep your room yard clean. We had some twine/string from the dollar store, paints, blue rocks, and hot glue already at home. We had the best time searching for things in the craft store and outside to use for the garden. We worked on it for a couple of weekends. First we cut the cardboard to fit Tulip's shelf. We glued the pompoms to a stick, and we glued two empty bobbins to the cardboard to hold the tree in place. The clothes line was made from two sticks and our dollar store twine. Scrapbook paper made the welcome mat. We used some blue rocks for the water and A LOT of hot glue. That is probably the only thing I would do differently. The rocks can become loose and fall off, but since the garden doesn't get moved around, I think it will be okay. I might go with scrapbook paper or paint if I had to do it over again. The seashell fountain is made from shells gathered from our annual beach trip. Lucky Tulip, got some surprise accessories from the Fairy Door Company to make her yard complete. It's amazing how Santa knows what you need. Tulip was super psyched about how well everything turned out, and so was D and I. This project cost under $10 to make (leaving out the fairy door accessories). The door was around $18-20. So, for under $30 I get an adventure spanning two years and still going strong that includes writing letters back and forth to my daughter, seeing her imagination blossom, watching her share the magic with her friends, and creating memories that we will both have for a lifetime,. That my friends is priceless.